Update: Arctic Sunrise departed this (Tuesday) morning on a voyage to deliver supplies to Puerto Rico. 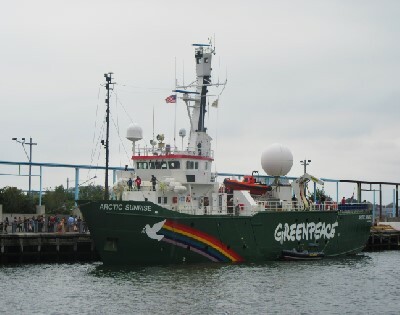 On an afternoon walk through Brooklyn Bridge park, your correspondent was surprised to find Greenpeace’s ship Arctic Sunrise docked at Pier Six, near the foot of Atlantic Avenue. I joined the line for a free tour, and with a group of about ten others, was led aboard for an interesting and educational experience. As we looked out over the bow, Catherine, a deckhand, told us about the ship’s ice-breaking capabilities and about her vulnerability to severe pitching and rolling in heavy seas because of her lack of a keel. Moving up to the bridge, we saw her up-to-date navigational and steering equipment. Paloma, who sometimes steers the ship, described how it all works. Moving down to the hold, where we found the crew’s bicycles hanging above, we were shown a very short film on Greenpeace’s mission. Proceeding to the rear deck, we were told about the ship’s present mission, which is to collect evidence of the pollution of the seas and adjacent waters by discarded “single use” plastic, and its effects on marine and bird life. Two crew members were panning water from the East River, finding many small bits of plastic debris. The tour took about twenty minutes. Arctic Sunrise will be at Pier Six through tomorrow (Sunday, October 15) and will be open for free public tours from 10:00 AM until 5:00 PM. Great to see them getting the word out in these increasingly dark times for environmental conservation in the U.S.